The online version of the Miners of the Little Cities Registry is available as a spreadsheet and will open when you click here. The Miners Registry is an attempt to gather the names of all people in the Little Cities area who have worked in coal mines. 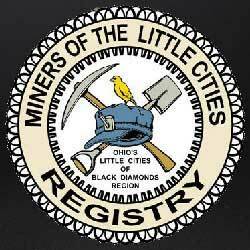 The first edition of the Miners of the Little Cities Registry was released in October 2008. Approximately 6,000 names have been entered into the registry. Over 400 of the names came from registration forms submitted by citizens since the announcement of the project. The balance came from research by LCBD researcher Cheryl Blosser and other volunteers. The registry is divided into four subsections: full list of names, followed by names with mines worked, unions joined and specific life events. Copies of the registry are available for $10 each from the Council Office in Shawnee. We hope to publish a new print version in the fall of 2013. Registration forms can be picked up at the Archives or downloaded (Miners Registry Form) and either dropped off at the Archives or mailed to: Little Cities of Black Diamonds Council, PO Box 128, Shawnee, Ohio 43782. For more info please call 740-394-3011. How up to date is the miners registry. I sent forms in but I don’t see the names I sent. We’ve had some technical difficulties with the Miner’s Registry that we hope to solve soon. Keeping checking back! I was born and raised in the coalfields of southeastern Kentucky. Many of my friends’ families left Harlan county in the 1960s for coal mining jobs in Ohio(New Lexington & Coshocton). I am trying to locate a childhood friend that I have not seen since his family left Kentucky, His name is Danny Howard and he would be around 60 years old. His father was Tesco Howard and he had a sister named Pat. If anyone knows his whereabouts send me an email at: kycolntn04@gmail.com. John (Simmy) Swyers, #5 coal mine, Murray City, Ohio, he started in the mines at the age of 8. Anyone ever heard of him? How do you add names to the miners’ registry? How do you get permission to use a story printed herein? Ray Miller ~ are you the grandson of Ida Fern Murphy Miller? If so, I am your cousin… daughter of Rosemary Murphy McDonough. You can download a form to fill out above under the miner’s registry logo it says (miners registry form), click on that and you can download the form. Which story are you looking to get permission on? Pardon my ignorance, but what does MI 1898 stand for? Is that Miner Inventory or such? Where does one go to look at the original documents? Thanks. Mine Inspection Report of 1898. This is a state required report issued each year from 1875 to around WWI as a book. You can find copies on line on Google Books sometimes. The State Library of Ohio has copies. I am looking for my Great Grandfather Patrick “Pat” Burns. He lived in Rendville /Corning area. Born approx 1858 in Scotland per census records, and was a miner. He died in July or August 1900. He was married to Elizabeth “Lizzie” McGinnis and had 5 children. Sara, Euphemia (Fame), Patrick, Lizzie, and Mary. It is possible he was hospitalized in 1900 in Mt Carmel Hospital in Cols.,Ohio. He was only 44 yrs old when he died. Hoping to find any information on him that I can. I love this site. I wish the pics of coal miners had names to them. Some of my ancestors family were from San Toy, Rendville, Corning, New Straitsville, Shawnee, Congo. Uncle Walt had gone to West Va. to work the mines, then back home to Corning, passed away in the 70’s AGranma lost a nephew in West Va. age 13. So sad, that young to be in such a very hard job and lose a life, by a minetrap. whatever that is. I will be back . Thanks for havaing this site up. Pat Burns who was born in Scotland. Lived in Rendville and was a miner. Pat died in the summer of 1900 at age 44. His wife Lizzie and 5 children survived. Joyce Store. I have been searching for years on Patrick ot Pat Burns. Have never found his burial place. Michele there is a old church there and I think a few graves, he might be there. There is a state of ohio website to locate burials.www.findagrave.com buried in Ohio..I hope you find him. who immigrated to the USA from Scotland and worked in the mines. I know he died at the age of 42 yrs of a lung ailment or pneumonia.